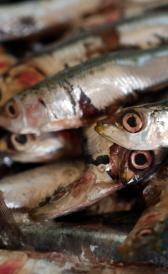 Raw european anchovy: Raw european anchovy is high protein, selenium and niacin. On the other hand. is low in carbohydrate, total dietary fiber and total sugars. Raw striped bass: High in selenium and low in carbohydrate, total dietary fiber and total sugars. 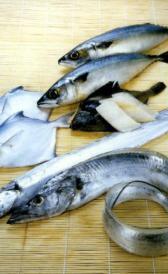 Raw bluefish: Raw bluefish is high protein, selenium and niacin. On the other hand. is low in carbohydrate, total dietary fiber and total sugars. Raw burbot: This food is low in total lipid, carbohydrate and total dietary fiber but Raw burbot has protein in high quantity. Raw butterfish: This food has a low quantiti of carbohydrate, total dietary fiber and total sugars but has a high quantity of selenium. Raw carp: High in phosphorus, vitamin d and vitamin d and low in carbohydrate, total dietary fiber and total sugars. Dry heat carp: Dry heat carp is high protein and phosphorus. On the other hand. is low in carbohydrate, total dietary fiber and total sugars. Raw cisco: In food has a low quantity of total lipid, carbohydrate and total dietary fiber. Smoked cisco: This food is low in carbohydrate, total dietary fiber and total sugars but Smoked cisco has choline, total, vitamin d and vitamin d in high quantity. Raw Atlantic cod: This food has a low quantiti of total lipid, carbohydrate and total dietary fiber but has a high quantity of selenium. 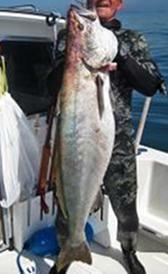 Raw Pacific cod: In food has a low quantity of total lipid, carbohydrate and total dietary fiber. Raw Atlantic croaker: High in selenium and low in carbohydrate, total dietary fiber and total sugars. Raw cusk: This food is low in total lipid, carbohydrate and total dietary fiber but Raw cusk has selenium in high quantity. Raw dolphinfish: This food has a low quantiti of total lipid, carbohydrate and total dietary fiber but has a high quantity of selenium and niacin. Raw freshwater drum: In this food there are some nutrients that are found in low quantity, for example carbohydrate, total dietary fiber and total sugars. Raw haddock: In this food there are some nutrients that are found in low quantity, for example total lipid, carbohydrate and total dietary fiber. Smoked haddock: This food has a low quantiti of total lipid, carbohydrate and total dietary fiber but has a high quantity of protein, sodium and selenium. Raw Atlantic herring: This food has a low quantiti of carbohydrate, total dietary fiber and total sugars but has a high quantity of selenium and vitamin b12. Raw Pacific herring: This food has a low quantiti of carbohydrate, total dietary fiber and total sugars but has a high quantity of selenium and vitamin b12. Raw ling: High in selenium and low in total lipid, carbohydrate and total dietary fiber. Raw lingcod: Raw lingcod is high selenium. On the other hand. is low in total lipid, carbohydrate and total dietary fiber. Raw king mackerel: Raw king mackerel is high protein, selenium and niacin. On the other hand. is low in total lipid, carbohydrate and total dietary fiber. Raw spanish mackerel: This food has a low quantiti of carbohydrate, total dietary fiber and total sugars but has a high quantity of protein, selenium and vitamin d.
Raw milkfish: Raw milkfish is high protein and niacin. On the other hand. is low in carbohydrate, total dietary fiber and total sugars. Raw monkfish: This food is low in total lipid, carbohydrate and total dietary fiber but Raw monkfish has selenium in high quantity. Raw striped mullet: This food has a low quantiti of carbohydrate, total dietary fiber and total sugars but has a high quantity of protein and selenium. Raw ocean pout: This food has a low quantiti of total lipid, carbohydrate and total dietary fiber but has a high quantity of selenium. Raw northern pike: This food is low in total lipid, carbohydrate and total dietary fiber but Raw northern pike has protein in high quantity. Raw walleye pike: High in protein and low in total lipid, carbohydrate and total dietary fiber. Raw Atlantic pollock: Raw Atlantic pollock is high protein and selenium. On the other hand. is low in total lipid, carbohydrate and total dietary fiber.